XCOM: Enemy Within has been sighted around the internet, though there's no official confirmation that it's anything more than swamp gas. Close encounters are always subject to speculation, but there have been multiple sightings of a previously unknown game titled XCOM: Enemy Within. The title has been spotted on the Steam database as well as the South Korean ratings board, where it's attributed to XCOM's current publisher 2K Games. 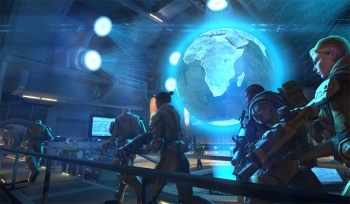 Details are thin at the moment, but it looks like we could be seeing a sequel or expansion to last year's hit strategy reboot from Firaxis, XCOM: Enemy Unknown. Multiple files with names like "XCOM EW" are listed on the Steam database page for Enemy Unknown, alongside previous expansions, so it could be more of an add-on than a full release. That said, Enemy Within certainly sounds like a sequel title. While we're grasping at straws, Enemy Within seems to point to a threat not from outer space, but from deep within Earth - perhaps a return to original X-COM's first sequel, X-COM: Terror From The Deep, which saw a new enemy rise from the bottom of the ocean. We probably won't hear much more about this until 2K officially pulls back the curtain - assuming there's no government cover-up - so in the meantime, keep your eyes to the skies (or maybe the seas). The nations of the world may soon need to activate the XCOM project once again.